I am really jazzed about this series of vignettes, and the TRA community exchange happening here in the process. I’m open to adapting the form of this to meet the needs of the participating community. So OFFER FEEDBACK please. Some vignettes will speak more to some members of the community than others. I hope to cover a range of topics (over the coming months, about once a week) so that TRA/multi-racial readers through adoption, marriage, birth and any other means will feel interested and invited to participate. Thank you to all who have enthusiastically endorsed this undertaking on and off line! Let’s get started. Before adopting Sam I had zero Black friends. I mean the kind of people who you call when you are excited about a life event, or in a panic. The friends who have to be at the graduation, or else it doesn’t count. I had acquaintances of color in college, and friends of friends when I lived in New York City after college. I dated a few Black men in and out of college, but had not remained friends with them. It was not about choice, I would tell myself, but circumstance. Was I waiting for them to find me? The present moment: I am sitting in a heart of the city diner waiting for Hassan to join me and the boys for breakfast. Everyone else in the very small breakfast nook is White-except for one other obviously TRA adopted Black girl, and an Indian woman with her toddler and partner. When he shows up Marcel hurls himself towards him, almost tackling him with love. Sam is more laid back, waiting for Hassan to come to the table to exchange greetings. My feelings for Hassan range from maternal to sibling like to occasional-groupie. Hassan is a beautiful, brown skinned jazz musician/composer in his mid twenties. He is an African American male born and raised in Cincinnati. He was introduced to me through Eddie-our former Haitian-French nanny-big sister-friend. Our family friendship with Hassan includes visits, texts, phone calls, and family dinners. As he reaches the table, I get up and meet him with a giant embrace. I consider for a second if the people in the diner think he is Sam’s or Marcel’s father? He looks older than he is. I realize I care a lot less what the hell people think about me and my family than I used to. We share a meal. We decide on the after meal outing. We talk about kindergarten, baseball, his visit home, and being a Black man in Portland. He says that he loves it here. He loves the space and freedom he feels to create here. He went to college near here, is discovering as an adult his profound love of the outdoors. He did not have this as a child, and is in complete awe of things like watching the sun rise from the top of a mountain, and being on a sail boat far enough out that there is only water on all sides. He paused. He thought. Then he said, “As long as they have friends who look like them, and who share the experience of being Black in the world, they are going to be fine. And they have that at school and out of school. It doesn’t have to be everywhere. It just has to be accessible in the form of a few close friends.” Of course this is his opinion, and of course this is what I want to hear. I realize this, and continue to push. 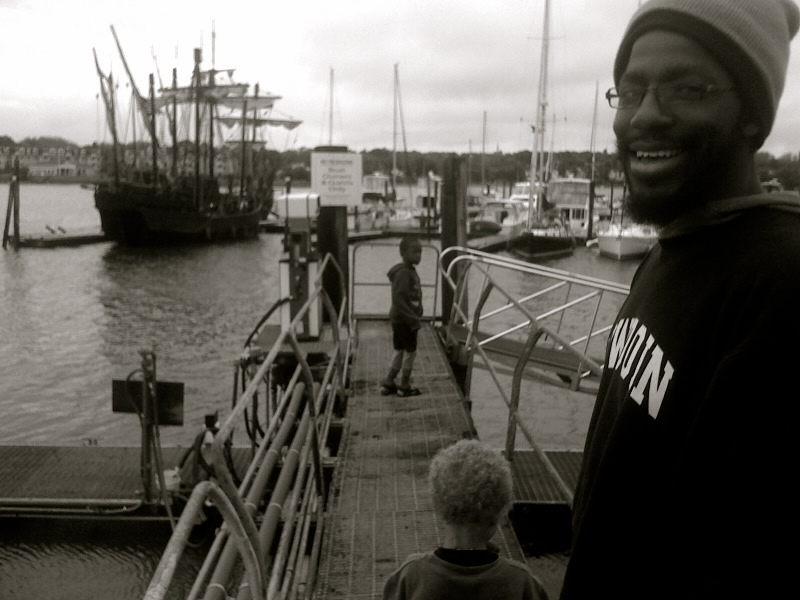 Between throwing rocks, and demythologizing Columbus (we were sneaking a pauper’s view of the Nina and the Pinta replicas from the adjoining boatyard in the misting rain) Hassan continued with his thoughts; “Travel” he said “is key.” What ensued was a conversation about creating awareness of the world around us. How easy is it for you to travel? If you are not in an ideal situation, are you committed to frequent trips to places where their race/ethnicity is the social and cultural norm? After parenting transracially for almost seven years, I can now count on three hands the adult Black and Biracial friends that we see on a very regular basis--to share a meal, a baseball game, or family celebration. This translates to almost every few days that my kids are spending time with an adult or young adult person of color in addition to the children of some of these friends who are also Black or Biracial. In this list I include African American families, African families, Muslim and Christian families, American and foreign born Black families. In addition we meet on a semi regular basis with other transracial adoptive families, which meets many other needs, and will be talked about in future vignettes. 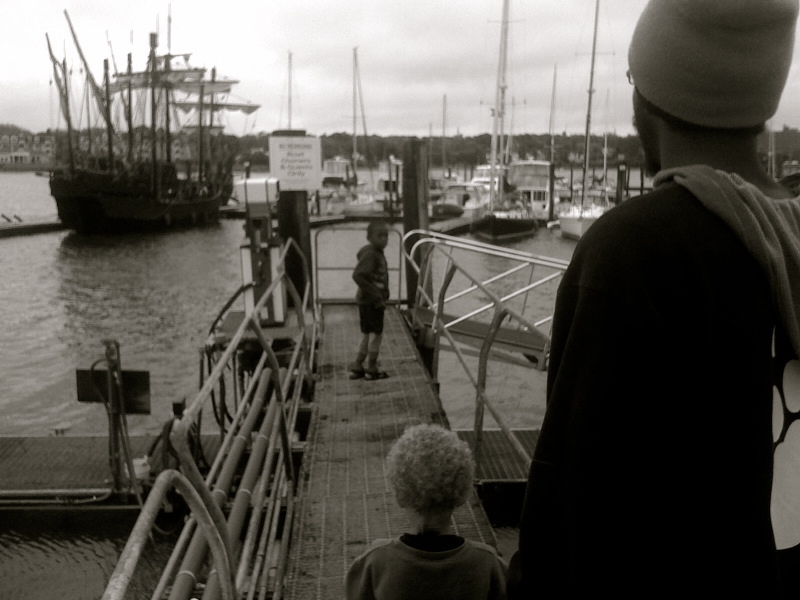 The questions: Is having ongoing friendships and in some cases mentorships with Hassan and other friends of color (ongoing equals shared meals, outings, playdates and the like) the kind of meaningful access to a “racial check point” and connect for my sons to fully or partially meet their needs at this moment? What about when they are older? Does knowing that our extended family is racially inclusive-counterbalance for my children the knowledge and experience- that our larger community appears quite often to be more racially exclusive by in large? Question for Adult Transracial Adoptees of Color: If you lived in a predominantly monochromatic area growing up, did your parent(s)/guardian(s) have or make friends of color who became important to you? What recollections can you offer here to help families go about this piece better or differently? Did you feel like you were able to learn race related navigational skills from one or two mentors or family members–or was that only partially helpful? Would you agree or disagree with Hassan who is not an adoptee that having a few good friends who look like you, and share your experience of being Black/Asian/Biracial/Latino/Other is enough? Or not? Question for First parents: How important was it or is it to you now– the racial/ethnic make up of the adoptive parents’ social/religious/educational community? What were your expectations or hopes having to do with these questions of race/ethnicity and place? What kind of choice did you have concerning place and the families that you were considering if applicable? The how-to’s: Are you wondering how to go about making friends outside of your ethnic or racial group? I asked people who knew me well if they had friends they could introduce us too. Friends with kids, friends without. I had a group of business cards printed up, with a picture of us on one side, that I handed out to people at the swimming pool, or the playground in it felt like an easy connect. Once in a while those materialized into a playdate. All of our dear friends now, were introduced to us by other ear friends. How have other people gone about making friends? To keep in mind: YES it can feel awkward. And, so what. That is our job. To get passed the awkward and the uncomfortable so that our kids don’t have to live that story everyday of their lives. So, who doesn’t like to be an expert? I have found that in directly asking for HELP in providing my sons and myself with Black and Biracial role models I immediately put people at ease. People love helping kids, and being asked to help period I have found. All you need to get started in shifting your social grouping is one new friend. You’ll either click or you won’t. (I am working on another post, on how this might be easier for me as a non partnered parent.) Online friends of color are a great start, but they don’t count when your kids are concerned. Unless they manifest in real time too! Have something to add? Please join in. If you feel willing and able to introduce yourself, and what brings you to the conversation, I think it helps to encourage others to share too. And please spread the word to others you think would enjoy the topic, offer insights etc. Feel moved to do your own post on the topic? Have at it, and link back here if you feel so inclined! Like what you are reading? Want to help support the ad free, unpaid excellent dialogue and writing here? (This post alone, clocked over eleven hours from me-worth every second. ) Simply click or over on the side bar where it says “donate to Mama C and contribute what you will. $10.00 gets you a sheet of most excellent stickers for that bland part of your fridge, or your kids magnificent outfit! THANK YOU. I am an adult transracial adoptee and I was fortunate to be raised in Detroit where I always had contact with people who looked like me. I gained such a great pride in who I was by watching and interacting with people of color. My black friends showed me a strong race of people that the world didn’t show me. My black peers became my role models and I wanted to be like them and part of that community. This created in me a strong sense of what it means to be black which helped counterbalance the world’s constant whispering that because I was a child of color I was not good enough. This community not only showed me that the world view of people of color isn’t true, it showed me that I, as a child of color, am powerful. have value, and belong. This pride that was instilled in me early on made it possible for me to survive those instances where I was the only one and was singled out or belittled simple because I was different. My white parents really couldn’t teach me how to navigate through this world as a child of color. Other minorities couldn’t teach me how to move through this world as a black boy. The black community was the connection I would need to teach me so much about myself. Having someone who knows what it is like to live life as a black boy/man was invaluable. Having a place to go and exhale and unload the frustrations of an unequal society was affirming. Transracial children need that today just as much as I did growing up. They need people who look like them telling them it’s alright to look like them. They need mentors and role models who can share experiences their white parents don’t have and it is up to their white parents to create those connections not only for the adoptee but for the entire family. When the entire family has relationships with people that look like the adoptee it sends a strong message that people of the child’s race are important. Mama C, you are so right it only takes one connection to create the change. I often speak to transracial parents and I tell them this over and over. The person of color in the grocery store could be that connection or could connect you to someone else. Yes it is initially awkward but the awkwardness you feel in those first 10 seconds is often how a child of color feels everyday all day when there is no one else around who looks like them. Thank you so much for your in depth, reflective, encouraging response. The line that really resonates for me in what you said was; “it sends a strong message that people of the child’s race are important.”In our home that was so clear first in theory (books, posters, movies, music) and now so much more so in practice- via friendships, connections, going to celebrations (parties, weddings, graduations) where I am the minority more often then not. I am the one learning first hand with my children–and making the effort to feel included, while they just are included. Can I ask you to speak specifically to families who are not living in racially robust areas, and who are not seeing people of color often in the day to day environs, but are nurturing the individual connections we are talking about? I understand that for you growing up the community was racially mixed so that that wasn’t the issue for you. As an expert on the topic–would you encourage people to make such a move even if they were tending these one on one relationships with rigor and intention? Can a handful of mentors ever be enough? Or is it just a kid by kid/family by family discussion and not an absolute? Thanks again for accepting the invitation to read this post, and comment here. It’s a honor to have you share your time and experience with our readers. Here’s my question – and maybe you are already planning to write about this – but have you asked Sam and even Marcel about how they feel being one of very few people of color where you live, or if the deep relationships you are builidng with adults of color are enough for them? I ask because my daughter has already made comments about how she doesn’t like being the only one with skin like hers in her pre-school class – and for the record, there are other African and African American kids in the school, just not in her class, and most of the other kids in her class are Asian, not white. I am very new to this whole discussion. My white husband and I have 3 biological sons and are in the process of adopting a beautiful little African American girl. We have been fostering her since birth. We have several black acquaintances but do not have strong friendships of color. I appreciate the idea of asking for help. I am completely willing to ask for help, but was unsure if it would be offensive. I am so glad to find people willing to dialogue honestly about the topic and ask others’ opinions who have such wisdom to share. Thanks to everyone. Liz-thank you for joining in here. I hope others chime in here too–but my experience is that people LOVE to be asked to help. By asking you are saying; “You are an expert where I lack completely. Our daughter needs your help, and so do we. Are you willing to visit with us sometime? Can we have you over to lunch? Can I pick your brain on other ways we might open up our social circle and step up to this plate for our entire family? Liz, Thank you for reading and posting. In Sam’s preschool this was the case too. There was only one other brown skinned student in his class, and a few others in younger rooms. (I worked hard to get families of color that I knew to go there!) What do you know about the kindergarten where she will go? Yes, Sam noticed too, and does not comment as much now (see below). Great question and approach for this series=asking the kids. Maybe we could get a kids response post going for later? Contrary to popular thought, neither of my kids are “one of the only kids of color” in their schools/ where we live. This is where ethnicity and race come into play. In Sam’s case he was one of six Black children in a class of eighteen kids. Three of of those six were also African-American and Biracial vs. African (as in 1st generation American in most cases, and some foreign born recent immigrants). There were also two Vietnamese boys, and two Latino kids. The other eight kids were White. On his basketball team and league a less diverse mix–but he was one of three Black kids on the team. On his baseball team, he was the only Black kid. In his swim lesson now, he is one of two Black kids, out of seven swimmers. This was the same the last three lessons he signed up for (all different kids too!) So it is not WHITE WHITE WHITE all the time. We do live in the HEART of town. More kids on a block. We go to the most diverse elementary school in the state. And, since so many of our Black and Biracial friends have kids my kids’ age who are also Black and Biracial our community is growing. So I don’t know if Sam’s experience is shifting pretty substantially, because of a shift in the community demographics, and our intentional community building combined. Marcel has several friends of color, both adopted and biological in his school too. Unlike Sam, Marcel’s lead teacher is also Black. At Sam’s camp yesterday however, the lead counselors were an equal mix of Black and White, and the campers were also a surprisingly equal mix of everybody. But that is a surprise. (And indicative I believe of a trend here I hope). But then when we went to the “Friendly” restaurant the other night as a “treat” we ALL noticed that EVERYONE except us was white. The good thing was that we noticed it–because honestly that feels like less of our experience these days. Thanks for the response – now I am thinking I need to move to Portland, I love what you describe! Elfe is going to a Boston Public School in September for K-1 (for 4-year-olds), I’m happy she got a spot (it’s a lottery system and for 4-year-olds you are not guaranteed a seat) and the school she is going to is in a diverse neighborhood, but because of how the lottery system works it seems like she will once again be one of the only brown-skinned children in her class (we went to a kindergarten orientation session a few weeks ago, there were plenty of white kids, Latino kids, but I didn’t see any Black kids). The Boston Globe did a story on her new school a year or two ago, about how the school has made a turnaround in recent years, and they chose to title the article “The Year the White Kids Came.” Race and class are so intertwined here, and it becomes really obvious when it comes to the hot-button issue of schools with it’s legacy of busing. I am thinking about writing my own post on school choice in Boston and how there’s a whole other layer of complexity to it when you are the white mother of a brown child! The other issue that concerns me about school is the color of the people in charge – I’m less than pleased that the school principal and both of the teachers she could potentially be assigned to are all white, not sure about the rest of the teachers and staff. Yes–when the teachers and staff are all White then that becomes another issue. When FIBN author Liz writes about the teachers and principal being all Black I feel super deflated. And, like they did before me, I am trying to encourage people of color I know who are in education to consider applying there… but it isn’t that simple of course. At Sam’s school the librarian and two after school Rec teachers were the only people of color in positions of leadership. We have a chief of police who is Black, but I believe that he is being courted to work in of all places…Hassan’s home town! Urg. Awesome post. We are an interracial family living in Oregon (are you in Portland, Maine or Oregon?) and have two boys. We live in the Portland-metro area and it is predominately white (duh, its Oregon), but interestingly enough, there are many, many mixed families of all kinds here. So I definitely go out of my way to befriend families like ours, but also want to raise our kids to be confident in who they are no matter who they are around. We’re in the OTHER 🙂 Portland–Maine. Great to hear from you here. How old are your kids? What do they think about where they live? I’m excited to get a post going where the kids chime in too! My kids are still very young (3 yrs. and 9 weeks) but I am waiting for the day when my oldest starts noticing his environment in terms of race. I’d really like to know his POV as a mixed race person, since my only POV is from a black perspective. Right now, his playmates are a mix: white, black, bi or multiracial (one little boy is Nigerian, White and Indian). “Transracial children need that today just as much as I did growing up. They need people who look like them telling them it’s alright to look like them. They need mentors and role models who can share experiences their white parents don’t have and it is up to their white parents to create those connections not only for the adoptee but for the entire family. When the entire family has relationships with people that look like the adoptee it sends a strong message that people of the child’s race are important. It is really amazing how you echo the sentiments of the beautiful grown Transracial adoptees that spoke at a recent workshop I attended for those of us who have adopted Transracially. It just confirms absolutely everything I’ve been feeling since my son came into my life. I would reccomend your post as a reread again and again. Where do you live, and through what organization was the workshop run? I am a foster mom in St. Louis, MO and have been trained as such, but was only given a booklet that about transracial adoption……I haven’t gotten much honest training on the topic. Thanks for this. It’s timely for me but in another way. Little Dude has been struggling with the donor vs daddy thing for a while, if not only because of the language of his schoolmates who were, mostly, abandoned by their fathers. I’ve been attempting to friend choicemoms out here but there’s a barrier. Your post helped me understand the need for not only friends for him who are being raised by choicemoms but friends of color who are being raised by choicemoms. I’m in Denver, a place where it is quite easy for me to find friends of every hue/creed/etc. I didn’t realize, though, how hard it would be to connect with children who look like Little Dude and who are being raised by a choicemom. So, even for me, the question arises – is it enough to attend a Black Church, to live in a racially diverse neighborhood, to have him around Black musicians, etc when his perception of himself includes the “donor conceived” and no one who looks like him shares that and no one who shares that looks like him? Moving back to the East Coast, in my mind, would open the door for a multiplicity of family structures of color. So should we stay where we have developed these relationships that are, in many ways, lacking or should we go where we have the opportunity to develop relationships that will be more beneficial to him? Made me think. Thanks for that. And hi to the boys! Brandee–SO happy to see you here again MAMA!!! I am putting the boys to bed, and then I am going to think about your questions, and I’ll be in touch tomorrow. Perhaps others will have other thoughts in the meantime? Wow! This is straight out of my brain! I also don’t really have any black friends, acquaintances that I enjoy seeing when I occasionally do, yes but not regular playdate, dinner, phone call friends. I had a handful of dates with AA guys in college and a few with a friend more recently but nothing really came of it. A couple of random thoughts that bother me: (really putting myself out there, since I worry what people will think, but this seems like a good place to do it) I always worry that if I seek out AA people to become friends with that it will seem like I’m only doing it for my kids and I wouldn’t have done it otherwise. What does that say about me? That I need AA friends but with an ulterior motive, not just because I like them? The truth is many of us, myself included live our lives within a certain circle of people and it happens to be white. I work in a symphony orchestra, a very white business. I work, I come home and take care of my kids, my friends are largely colleagues and fans of the orchestra. I’m not intentionally trying to only have white friends, it just happens. My immediate neighbors right next door are an AA family with 3 kids ranging from about 6 to 15. And I’m ashamed to say I don’t even know their names. We’ve been introduced but I’m terrible with names. We chat as neighbors do over the proverbial fence but that’s about it. I constantly think, we should be friends, but I don’t know how to get past the once a week, “hey, how you doing?”. It’s ridiculous. I mean they are busy, I’m busy but is it so weird to just go and knock on the door and say, can we hang out, I think it would be fun for all of us? It just seems like after all the years of living next to them and then suddenly wanting to be friends I’m saying “my kids really need to hang out with you because you are black.” It’s easier to connect with other families like our own, white parents who adopted black children, that I have. You immediately have something in common. My question, how do you put yourself out there with strangers and make these connections? It feels so awkward, maybe you all can make suggestions on how to break the ice. I really want a friend like Hassan in our lives, maybe not only for my boys to see their skin color but as a male influence as well. All of your questions are GREAT questions. And any of your approaches would be fine! Maybe I might make do something like design a little “Getting to know the neighbors Ice Cream Social” and invite four or five neighbors. Deliver the invite by hand, and get your kids involved in the design. I think humility is a lovely starter! “I feel so strange that we have never connected, and I think we’d selfishly gain so much from getting to know you better….” If they can’t make the time you suggested–BE PUSHY and ask when would work?! You have NOTHING to lose. Again I want to say–AWKWARD is OUR JOB. Better you than your children. These could be life long friends, or through them you might meet other friends for you and your kids. Who knows, they might be wondering how to reach out to you too?! Check back in and let us know how it goes! That is my two cents! Anyone else? I’m very interested in this post but can’t contribute as an expert. I’m a white girl from Maine, raising an ethnic Russian 7 year old girl as a single mom, and we have living with us my (male) friend Elmo from Puerto Rico, so I guess we’re kind of a hodgepodge household. I’ve been working on homestudy paperwork for adoption #2, looking possibly at Haiti, Africa or domestic to adopt from. We have a world map hanging in the living room with a sticker representing everyone’s place of birth (I’m the boring one born in the continental US). As far as I know, in a town 10 miles from Mama C’s, we have no administrators of color in our school district, and only one teacher that I know of, but there may be more. The student body is slightly more diverse, but not dramatically so. Not sure I was done, but the computer wouldn’t let me type anymore. Looking back, Jupiter has had one child of color in her class in both kindergarten and 1st grade, and one on her soccer team this spring. Looking forward to reading all the input from others as a potential transracial parent; in a state where the one person of Asian descent in my department (of about 35) at work considered herself the “bingo free square” when we had a baby picture contest. Can’t wait to read the next post. One more thing I have been thinking about….my little girl has several siblings being cared for by her overwhelmed maternal grandmother. The grandmother obviously is heartbroken about not being able to take my little girl, and has only had one visit with her. The grandmother told us that the oldest sibling really wanted to see his little sister. I would love for little Drea to know her grandmother and siblings, and have kicked around the idea of writing grandma a letter asking her to be involved in our lives. I am not sure why I hesitate…..but would like opinions. What do you think? I think I would write her right away! What an amazing opportunity for everyone involved. Take your cues from your daughter, and the grandmother. If it were me I would just be super honest and say; “I’d be honored and thrilled to have a chance for us to meet again. What would be easiest for you? ?” It may be full of feelings, and emotions, and hard work for all–and as a good friend of mine always told me; “Imagine yourself ten years from now saying to your daughter; -I’m sorry I didn’t ever contact your grandmother before she died…I just hesitated for some reason…” And that would get me writing that letter ASAP. Others may disagree, but that is just my opinion. Perhaps you have a SW/family counselor very knowledgeable in adoption issues that you trust to help support you/your daughter in the process? Thanks for your thoughts. I agree with you. My little one is turning a year next month, so I need to consider how she WILL feel once she grows a bit. I like what you said about awkward being our job. As our child’s advocate, that is our place. This is a very encouraging discussion for me. Thanks again. [nod, nod, nod] We went through the same social-circle-analysis after adopting our boys. And we, too, found ourselves lacking. At first I wondered how people would take it that we were basically racially-profiling and wanted to be friends with them because they “matched” our sons. Turned out everyone else had already noticed we were white parents of Hispanic kids (duh), and they were just pleasantly surprised that we could humble ourselves TO ask for help. It’s hard to say, yet, how our kids feel about it. They’re not quite old enough to step back and analyze the situation. And by the time they ARE old enough, they’ll have been connected to people who look like them for as long as they can remember. So we’ll (thankfully) never get to compare life with- versus life without this social network. Gotta say it’s also given me a lot of experiential insight into what it feels like to BE the minority person, too, when it’s just me, the kids, and a whole bunch of other Spanish-speaking tan folks. It has definitely made me more sensitive to how I’m being received the rest of the time when I’m back in the white majority. Thanks to everyone who participated so far–this conversation is so refreshing and inspiring to me. I hope that people feel inclined to continue to respond to each other here, or from the emails people include with their posts. I have gathered a list of eight new topics-vignettes to keep us thinking about all of these issues and more. @ Wendy–the “bingo free square” line is the beginning of a story some where! Wow. Thank you for sharing your thinking here too. I am eager to hear more about your process and adoption considerations! Catherine, I really appreciate all the time and effort you’re putting into this conversation. It’s just what I’m looking for. I do get that it takes a lot of time and that’s why I made a donation. We’re white and our adopted 14mo-old daughter is bi-racial–White and African American. We live in an area that’s fairly mixed racially though a majority white. I recently ran into a Black woman I had worked with years ago and we made plans to get our families together, yay! One of the things that I think about a lot is the choice we’ll need to make about schools. The schools in our town are not very good, and the schools one town over are quite good. There would be a much larger percentage of Black kids in the local school system. I’m torn about which to prioritize. I just love love love this discussion. I have one Black friend. One. He is a very good friend. He is in my will as a guardian if anything happens but he is only one person. Tomorrow my daughter’s hair will be done by one of our neighbours … the hair thing is my “in” with Black women I meet. I am so hopeful this turns into a more friend based relationship. I would really like to see that card you made and handed out asking for help. That is brilliant! When it gets awkward again, and it will, I will tell myself “this is my job, this is my job .. stick it out .. keep going out of your way.. this is my job”. Would love to guest post / link as well! You are welcome to link away my posts anytime. It is always nice to be told about it of course. If you want to guest post here–send me an email off of comments, with what you had in mind? (mamacandtheboys at g mail dot com). As for the cards–I literally made a little standard business card–with a photo of us (my avatar shot) on one side, and my email/phone on the other. Easy to just hand over! Costs about 10 dollars for 100.